quarrygirl.com » Blog Archive » vegan las vegas! pizza place at wynn! we opted for the vegan version of the “meal deal”: a 12 inch pizza with a choice of salad and side for $24.50. 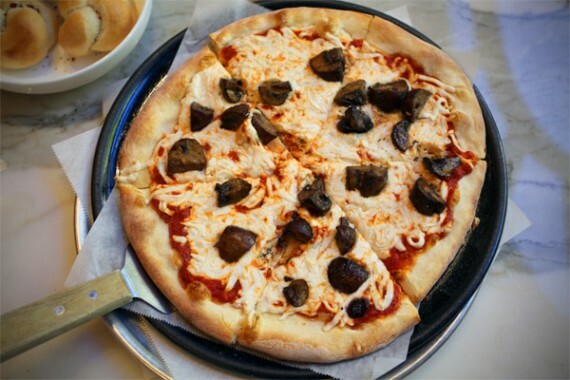 for the pizza, we went with a 12″ vegetarian pie covered in “cheese substitute” aka teese along with mushrooms. for the salad, we got the house salad (with no peppers). 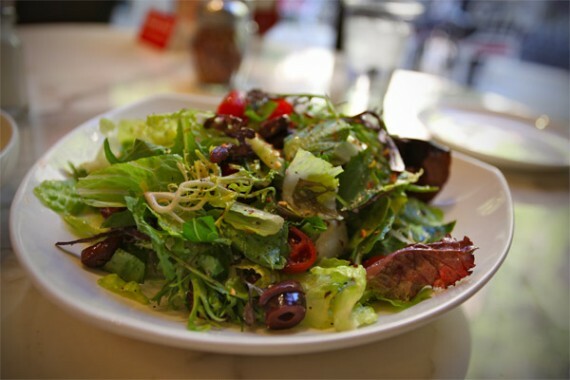 house salad: mixed greens, roasted peppers, olives, cucumbers, peperoncini, red wine vinaigrette, cherry tomatoes. everything was spectacular, but the real stand out was the vegan pizza. i am loving the new teese, and pizza place really knows how to cook with it. 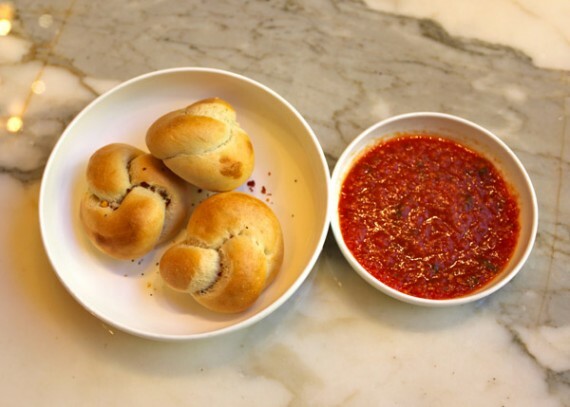 it was stretchy, delicious, and just…perfect. 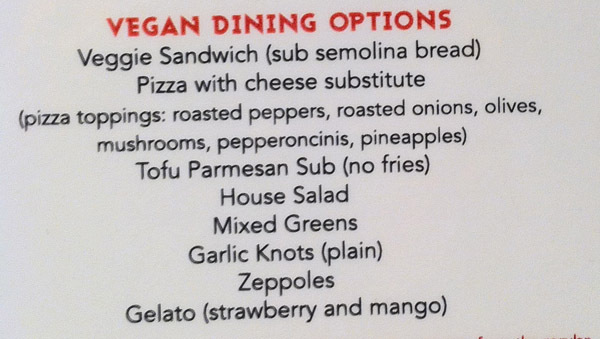 two years ago, we didn’t even have decent vegan pizza in los angles. 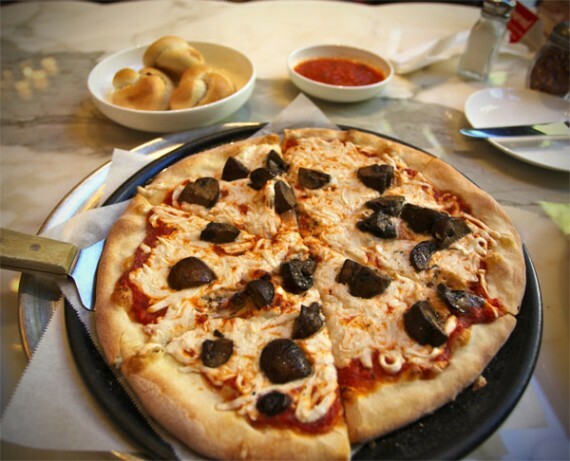 now there’s a prominent las vegas strip hotel serving up nyc-style pizza with vegan cheese? TAKE ADVANTAGE, PEOPLE! i have been wanting to check out the new options at the wynn soooo bad! and i also love the new teese… had it on a lucifer’s pie and it’s tha bomb. Jerks! I’ve been wanting to go there since Wynn veganized and I haven’t made it yet. glad it’s good though. maybe i can round up a las vegan to go with me one day…..
Just returned from Wynn/Encore. Had Thanksgiving there and yes..VEGAN! Be sure and try Switch’s vegan menu along with the Society Grill’s menu, and even Red 8 (at Wynn) veganized a dish that wasn’t on the menu! My husband and I always stayed at either the Wynn or Encore, that decision is now sealed and will never change. Perfect timing. Heading to Vegas in three weeks. Grateful! I am so happy to hear about this! Several years ago I used to go to Vegas for work. It was the hardest place to find vegetarian, never mind vegan, food. It’s lovely how fast things can change. Awesome…we’ll be in Vegas next week. Thanks! Going to Vegas in January so will definitely be there!!! SO excited. I’m with Sunshine K. I’ll make sure I stay at one of Wynn’s hotels any time I go, even if it costs more. This is awesome!! Looking forward to trying these great veg options. I’m putting together a group trip to Vegas in May and we’ll have to add this to our list of restaurants to eat at. For anyone interested, more details about the trip can be found at http://www.vegansinvegas.com. Finally had a relative visit so perfect time to try Stevo’s food for the first time. Hate to say it, but I was disappointed. Every restaurant had basically veggie plates (nicely & “chef-ly” described – but still just veggies). Stratta had basic spaghetti & cheeseless pizza. Relative hates asian so couldn’t go to Red8. Reminded me of all the “vegetarian TopChef episodes. Borrrring. Ended up at Pizza Place. Got the 12” meal deal w/veggie pizza. SIX tiny slices of pizza = 1 pie. Big mistake is trying to split it with 3 people (1 being teenage male with TWO hollow legs). Said child thought it was all for him. Little did he know… Lots of melty cheese, but hardly any veggies – I counted just 8 individual mushrooms, maybe 12 olives (kalamata-not black/green), about 10 red pepper slices and couldn’t detect any onions. Very disappointed. And why is every vegan dessert sorbet or gelato? Don’t we deserve vegan baked goods? Or could it be the pastry chefs are not capable of vegan baking?